NEW iJoy HT-5270 Human Touch Home Massage Chair / Recliner with Body Scan Technology + Calf and Feet Massager - As one of the sleekest, most compact models we offer, the Human Touch® HT-5270 Robotic Massage® chair is the perfect fi t for any space, and the perfect blend of form and function. The HT-5270 is suited particularly for a person with a moderate frame of 5’ 10” or less who is looking for a rejuvenating and invigorating massage experience. It’s loaded with features commonly found in chairs twice its price, delivering an invigorating head-to-toe massage that helps alleviate stress, tension, back pain and sore muscles. 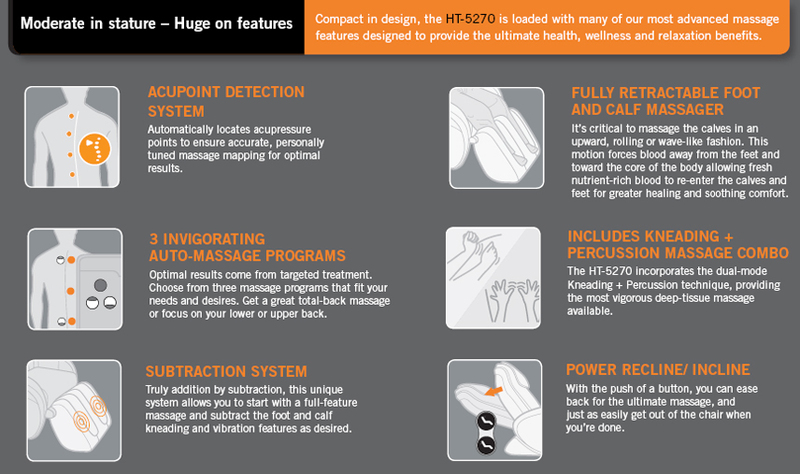 Lean back in the comfortable leather-match upholstery, choose one of three auto massage programs, and discover how the HT-5270’s Acupoint Body Scan Detection sensors automatically locate your acupressure points to effectively target the massage to your back. The three auto massage programs, as well as the four individual massage modes replicate the techniques used by expert back and spinal care professionals. Which means a truly professional massage at your convenience in the comfort of your own home. Human Touch® is proud to offer a unique retractable foot and calf massager that stows hidden away when not in use. The patented Human Touch Massage System aids in improving blood circulation in the calves and feet. Kneading the calves in an upward motion relaxes tension in the muscles and improves blood circulation, soothing away foot and calf pain in minutes. The HT-5270 is expertly tailored to your body, your mood, and your lifestyle. Its sleek design and advanced engineering work together to enhance your overall well-being, leaving you feeling relaxed and refreshed. Acupoint Body Scan Detection System: To ensure an effective and targeted massage for all body sizes, types and pressure points, Acupoint scans the entire length of the back to create a map of key pressure points to target during the massage. Retractable Foot and Calf Massager: Fully Retractable Leg and Foot Massager hides when not in use. Wave action calf and foot massage with additional vibration for the bottom of the feet. Rich Leather Like Upholstery: Secured directly to the frame for maximum durability and aesthetics. There are no loose pads or sliding pillows to get in the way of premium massage comfort and performance. 3 Auto-Massage Programs: Three Massage Programs that fit your needs and desires. Total Back, Lower and Upper Back. 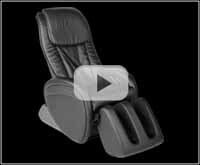 *WARRANTY INFORMATION: New HT-5270 Signature Human Touch Massage Chairs have a "5/1/1" Limited warranty. Signature HTT™ and HT™ massage chairs come with a manufacturer's five-year limited warranty against structural defects (Frame only - cosmetics are not covered). Factory Parts are covered for 1-year from the original date of purchase. In-Home service (parts and labor) is covered for 1-year from the original date of purchase for chairs in the US 50 states and most major cities in Canada only. Refurbished Massage Chairs have a 90 Day limited residential use warranty for parts only. Chairs are packed for shipping and require minor assembly. White Glove delivery, setup and box removal is available on all chairs to most US addresses for an additional fee. Warranty is not valid for chairs shipped out of the United States and Canada. In-Home Service is only available in the US 50 states and most major Canadian Cities. Extended warranties are available on New HT-5270 Massage Chairs. More Warranty Information.